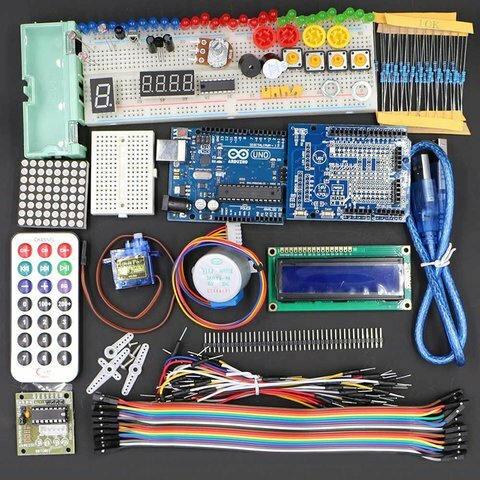 Haitronic Arduino Starter Kit is an electronic construction kit for individual assembly that includes a selection of the most common elements to learn the basics of electronics. 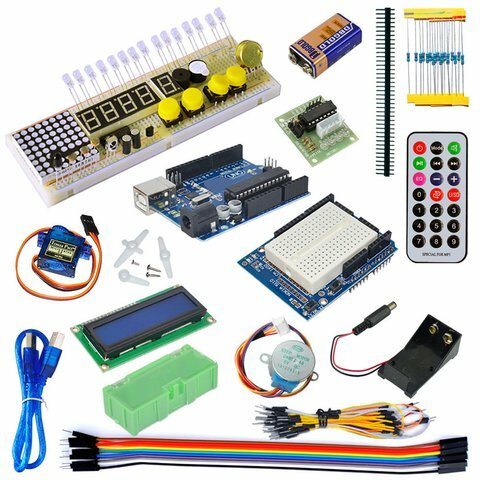 In time you will be able to build more complex inventions with this kit. It is the perfect hands-on way of learning how to use the Arduino platform. With thousands of instructions found online, you can control the physical world with sensors and buttons. This construction kit is an analogue of Arduino – an open-source prototyping platform based on easy-to-use hardware and software. Arduino boards are able to read inputs - light on a sensor, a finger on a button, or a message - and turn it into an output - activating a motor, turning on an LED, publishing something online. You can tell your board what to do by sending a set of instructions to the microcontroller. To do so you use the Arduino programming language and the Arduino software, based on processing. Includes all basic components to get started with electronics: UNO R3 board, light dependent resistors, flame sensor, etc. Great for DIYers and beginners with Arduino. Thousands of manuals and tutorials online. UNO R3 board — 1 pc. Mini breadboard shield with mini board — 1 pc. 830 points breadboard — 1 pc. SMD components box — 1 pc. LED (red, yellow, green) — 5 × 15 pcs. Digital tube — 2 pcs. Mercury switch or ball switch — 2 pcs. Flame sensor — 1 pc. Infrared receiver — 1 pc. Resistance 220, 1K, 10K — 5 × 15 pcs. LM35 temperature sensor — 1 pc. Male to male jumper wire — 30 pcs. 9V battery clip — 1 pc. IR mini remote control — 1 pc. 1602 LCD module — 1 pc. 9G servo — 1 pc. 5V stepper motor + ULN2003 driver board — 1 pc. Shift register 74HC595 — 1 pc. 8×8 dot matrix — 1 pc.